The Rookery and Carnoustie Golf Links have been unveiled as the new sponsors of Carnoustie Panmure Youth FC. Both organisations will be the main sponsors for Panmure Youth FC for the forthcoming season and provide the new home kit for six of the age groups from the youngest Academy team to the Under 12’s, meaning approximately 120 kids will be receive the new strips. Carnoustie Panmure Youth FC was formed in 1979 as Carnoustie Panmure Boys Club. Since its inception 40 years ago, the club has vastly increased in size, from two sides in the beginning to now having 12 sides in the Youth set-up ranging from 5-year-olds in the Academy up to 19-years-old. The Rookery logo features on the front of the Youth teams’ home top with the Carnoustie Golf Links logo on the back. 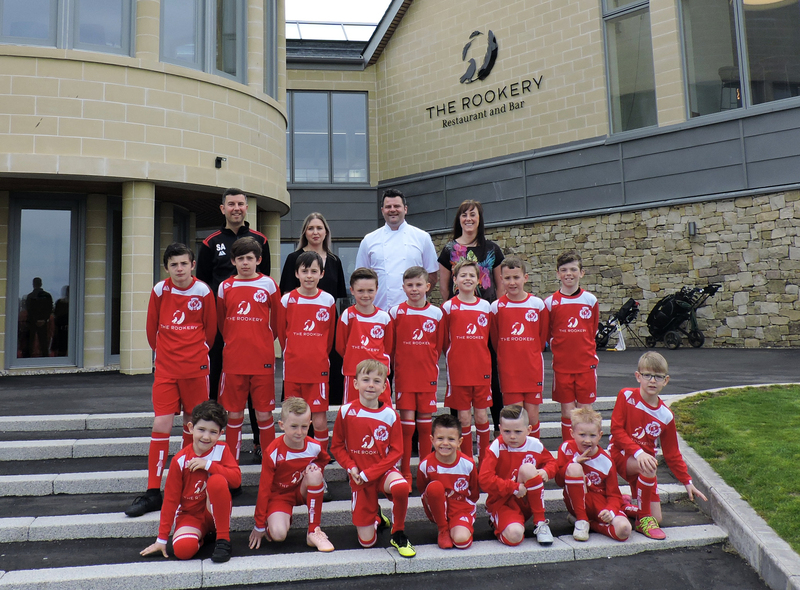 Michael Wells, Chief Executive of Carnoustie Golf Links, said: “We are pleased that both Carnoustie Golf Links and The Rookery are the new sponsors of Carnoustie Panmure Youth FC. “This partnership ties in with our organisation’s charitable objectives to be involved with and support the local community. “The club play such a key part in the local community in Carnoustie and gives so many children the opportunity to play the sport they love, improve their skills and make friends amongst many other things. Philip Hope, President of Carnoustie Panmure Youth FC, said: “Carnoustie Panmure Youth are a very progressive community led team that has been innovative to grow the game in the Carnoustie area and we are delighted to have The Rookery and Carnoustie Golf Links as both our home strip sponsors and community partner in providing opportunities for the youth to take part in sport. “We are hopeful that this new partnership will boost participation for all. Carnoustie Golf Links is a world-leading golf venue, home to ‘Golf’s Greatest Test’ and host venue for The Open Championship. In April 2018, Carnoustie Golf Links opened Links House, featuring The Rookery Restaurant and Bar. Since its opening last year, The Rookery has entertained some of the best golfers in the world and a number of well-known celebrities and has established itself as a venue for excellent local produce and stunning views. Image: left to right, back row – Scott Arthur, Vice President of Carnoustie Panmure Youth FC; Kim Speirs, Brand & Marketing Manager at Carnoustie Golf Links; Chris Hazelton, Head Chef at The Rookery; Stephanie Robinson, Club Secretary at Carnoustie Panmure Youth FC.